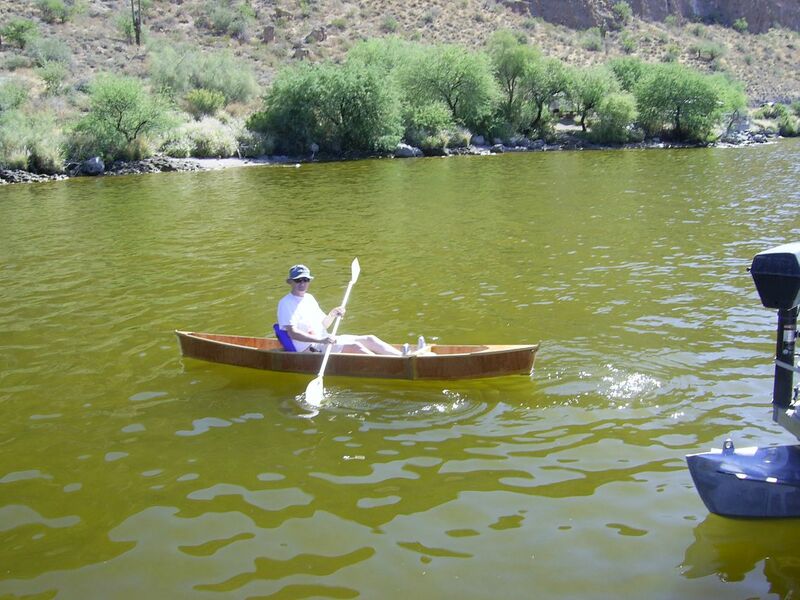 EZ CANOE is a 3 part canoe-like boat that paddles easily and nests to only 4' x 27" x 16" high. Fits in most cars ! 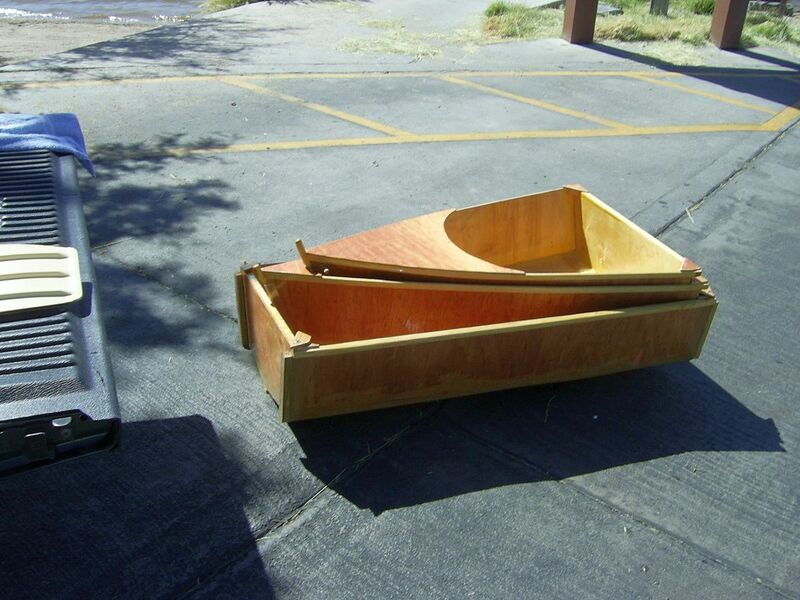 EZ Canoe nested, ready to load in truck. Video of EZ Canoe Hull Section Dovetail Assembly Method. 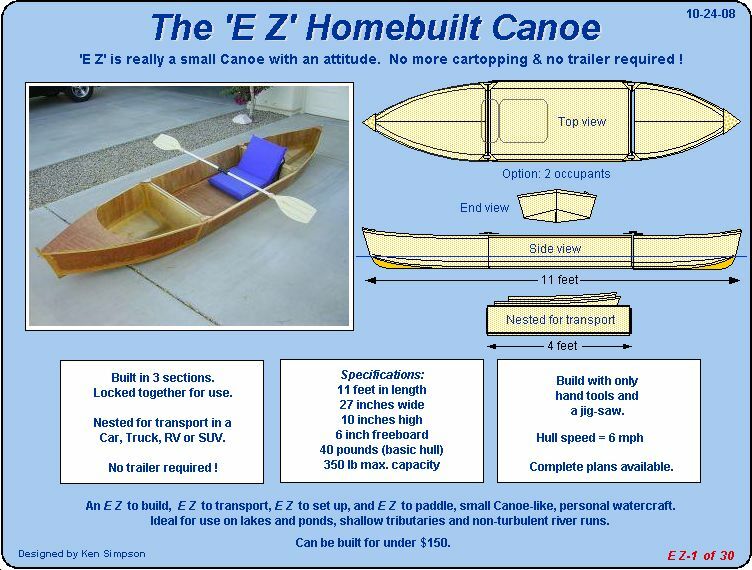 The concept for the 'EZ Canoe' was quite simple, and in line with other portable boats I have designed and built. After seeing people at local waterways cartopping canoes and kayaks, and struggling to get them off the vehicles and into the water singlehanded, prompted me to design a replacement, and the 'EZ Canoe' idea was born. It had to be transported IN the vehicle, not ON the vehicle, and it had to be lightweight. The 3 section nested hull design solved these criteria. It had to seat one person comfortably, two in a pinch (a design option). It had to be easy to build, requiring no expensive tools or fixtures. And, it had to be low cost. This is the first boat I have designed and built that will not use an electric motor for propulsion. Therefore, the ease of moving the boat through the water became paramount in the design. The long, narrow hull with the shallow 'V' bottom was the solution. The boat leaves virtually no wake, except for the paddle trail, and has proved to be quite effortless to paddle (or row if you so choose). It's lightweight and 11 foot length provide good directional control, with ample storage area for whatever adventure you may have in mind. And, it's easy to assemble. Just slip an end section into the dovetail guides of the center section, and twist the section clamps closed. That's it. 'EZ' ! The construction method is a little unorthodox, however, and may require that the builder experiment with the 'Tape & Glue' process prior to actually starting construction. This is similar to the stitch and glue method used by other boatbuilders, but without the stitches or epoxy. Weather conditions, heat and humidity, will affect the process application and curing times. 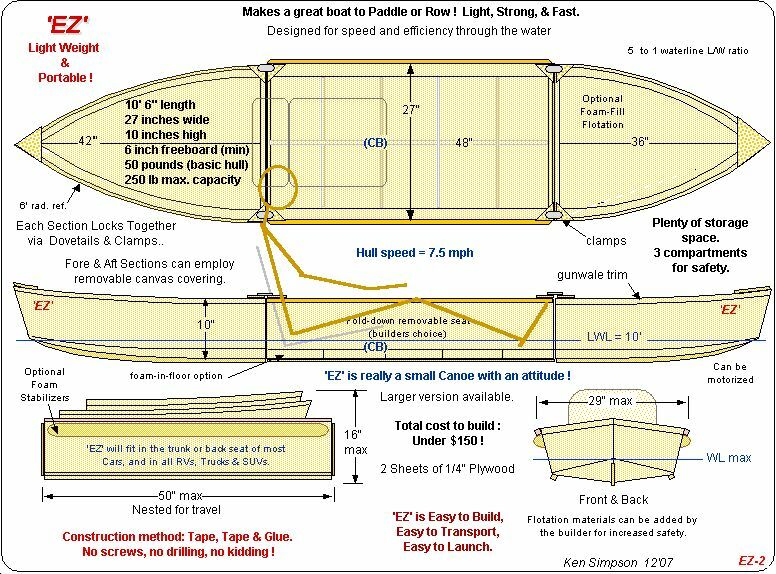 Other than that, everything is very straightforward, and a strong, lightweight boat is the end result. Construction options include gussets, additional decking and fiberglassing of the bottom, for use in harsher environments. Safety is always a concern in boat design, and the EZ is no exception. The center hull section (occupant compartment) has a sealed hollow floor for added buoyancy. The wood construction provides built-in hull flotation, and optionl, sealed, end compatments would further add to the overall buoyancy. Of course, individual flotation devices must always be used. This was a fun and challenging project for me, as I wanted to complete it in a short period of time, as the summer heat of Arizona was fast approaching (it's now 110F outside as I type this). Construction took a little less than a month, but only because I had other projects around the house that kept interrupting construction time. The plans includes drawings, text and pictures outlining the complete assembly process, with hints and tips to assist the amateur boatbuilder, as well as the professional. Good luck with your project, and happy boating ! Return to the menu for other Portable Boat Plans, or for How to Order Information.